Enjoy a relaxing moment in the Praça da República of Braga. 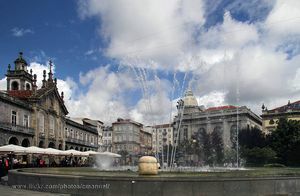 The Praça da República of Braga is a nice place with a lot of cafes and restaurants. It is usually a departure or arrival point very common when you do tours around the city. This place has a very nice and relaxed atmosphere especially at night because it has a colorful lighting. At night, there are a lot people of all ages who enjoy a moment of fresh air. Behind the cafe area is the Tower of Managem. It has a square structure and it is encircled by a wall. They are the only ones ruins of an ancient medieval fortified palace.